To start timing right away, press Splits, Strokes per Minute, or Water/Air Ratio . RowStat will create a Race or event for you. To create a new Race or modify an existing Race, press Race. 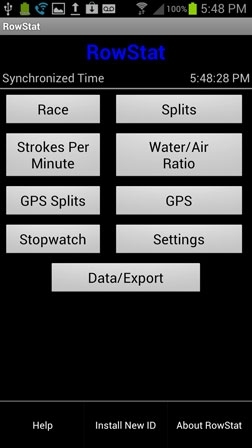 Choose Splits to time Splits, Strokes per Minute to time Splits and to record and see a running average Stroke Rate, and Water/Air Ratio see the average oar Water to Air ratio. Choose GPS Splits to time Splits with Split distances received from GPS. Choose GPS to be able to measure distance and speed with GPS. Press Stopwatch to bring up the Stopwatches. Press Settings to Synchronize the RowStat clock with other timing clocks, change the Date Format, or set the number of Strokes to be used to compute the running average. Press Data/Export to email RowStat data, set a default email address, set a default RowStat data file name, view RowStat data on your phone, or to Clear All Data. The RowStat data is recorded in Comma Separated Values (CSV) format for use by common Spreadsheet programs (Think Free Office, Google Docs, Excel). Your phone will have a “Menu” key or it may be shown as usually a stack of three short horizontal lines. Press and three more option keys will display. To see the on phone Help, press the Menu button on the phone and choose Help. This is available on all screens with concise help info for the associated screen. The Help screens scroll vertically, touch the screen move your finger up/down as needed. Press DONE when finished. To install a new RowStat ID, press the Menu button on the phone and choose Install New ID. You will have to request an ID & Password, to turn on RowStat. Please go to the request ID & Password form web page. Please complete the online form and select send. Your ID and Password will be emailed to the email address you provide on the form. 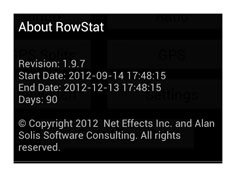 To see the RowStat version number and how many days are left on your RowStat ID, press the Menu button on the phone and choose About RowStat.